← Chick-fil-A. Christianity. And Bigotry. Four preachers were discussing the merits of various translations of the Bible. One preferred the New American Standard version because he believed it was more literal and comes nearer to the original Hebrew and Greek. The second preacher favored the New King James Version since it was updated from the King James he grew up with and retained the beauty of the language. The third preacher thought the English Standard Version was the better choice for modern readers. This story reminds me of Paul’s declaration regarding the Corinthians. “You are our epistle written in our hearts, known and read by all men” (2 Cor 3:2). Just like letters carry a message, so do our lives. There are all kinds of letters. Love letters. Angry letters. Congratulatory letters. Business letters. And even “Dear John” letters. Our lives, like those letters, convey a message. Your life and mine is communicating a message to everyone with whom we come in contact. It is often said, “That you never get a second chance at a first impression.” So, what is that impression? What does the letter of your life say when others read it? People are watching us, whether we realize it or not. They hear our words. See our actions. And observe our attitudes. From those observations, people draw conclusions about us. Our values. Our beliefs. And our character. Either for good or bad. Furthermore, if we are Christians, outsiders are making judgments about Christianity based on what they see in your life. Sadly, some in the public eye, who claim to be Christians, leave an unfavorable impression upon unbelievers. They are seen as charlatans. Hypocrites. And phoneys. In our personal and business dealings with others, if they see duplicity and dishonesty, it not only dishonors Christ but discredits Christianity. Racial slurs, off colors jokes, and crude, offensive comments about others, drastically diminishes our influence for good. Our salt has lost its saltiness. Our light has gone out. People see it. Read it. And react accordingly. While it may be unfair, people judge an entire congregation by one person they know. If that person is hypocritical, unkind, and unfriendly, they label the whole church “as a bunch of hypocrites. Have you ever invited someone to church and they sarcastically respond, “Yeah, I know someone who goes to your church.” Unfortunately, you know what’s coming next. Yes, ours lives are living letters that others are reading. 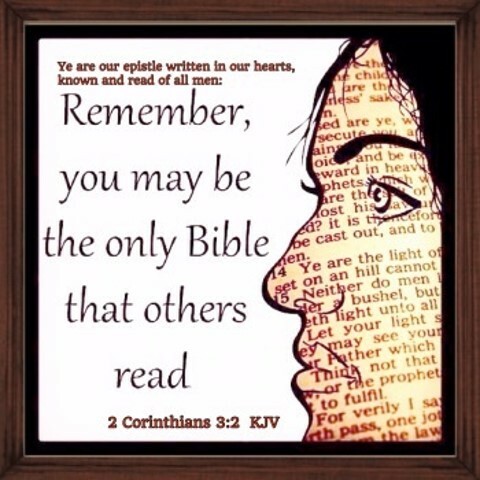 Some folks will never read the Bible, but they will “read” our lives. What is our letter communicating to an unbelieving world? It’s also good to remember that the pictures and thoughts we are posting on social media, are literally being seen and read by Christians and non-Christians alike who may not personally know us, but are drawing conclusions about our character and our Christianity. So edifying to read all your wisdom.